Melissa Miles, The Burning Mirror: Photography in an Ambivalent Light (North Melbourne: Australian Scholarly Publishing, 2008). This book is incredible from start to finish. Miles’ book positions light not as an ‘illuminating’ source but as a destructive force, one perpetually written out of, yet always leaking through, photography’s history. I highly recommend it if you’re interested in the history of photography. Absolutely – I found myself in the back rooms of the Medical Museion, in Copenhagen, face to face with wax moulages of Finsen’s lupus vulgaris patients, made over a century earlier and succumbing to the ravages of time and temperature fluctuation. A realistic wax face of lupus vulgaris patient is hard enough to look at; damaged and deformed, the visceral effect made a deep impression. It reminded me of Suzannah Biernoff’s work on WWI facial injuries. 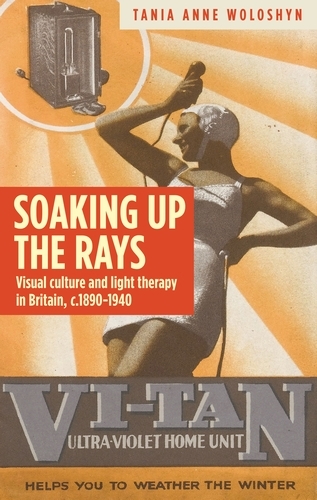 The moulages are a stark contrast to, say, the 1930s advertisement featured on my book cover of a home tanning lamp, where we encounter a representation of light therapy that smacks of glamour and sexual promise. Hitting a wall – from something as small as getting a sentence right to working through major arguments for each chapter – and managing to push past it to piece together and build the book, bit by bit. A bit emotional, if I’m being honest. A colleague of mine, Dr Mary Hunter (McGill), has recently published her own book with MUP and spoke glowingly of its support and smooth running. It was a no brainer. Fundamentally, no, I didn’t. My approach to writing an academic text about my subjects is driven by primary material: the images/objects and key quotes (especially the epigraphs). Each chapter of the book is set up this way; an image opens, then drives, each chapter in tandem with significant quotes from the period. The pairing of image and text may be complementary or may be contentious. My analyses, broken into sub-sections and themes, are woven around the images and texts – it’s one of the reasons I pay such close attention to the primary literature, evident in the copious endnotes (! ), and the very language used to describe and explain light therapy, which of course feeds into visual and contextual analyses of the images. Not really! I have thought about a new (related) project on the history of British naturism, particularly to its visual culture via specialist nudist magazines – another contentious subject indeed! – but as yet have not moved forward with this. Category: Art History, Author Q&A, History, Medicine	0 Comments.